As Greg and I stumbled down the street to Conor Byrne’s for a nightcap under a hugely full parchment moon, our ears ringing, we were in something of a state of shock. 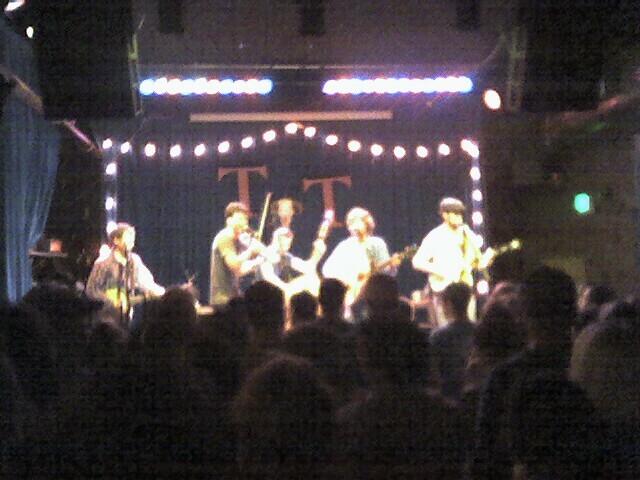 We’d just left the slightly smoky confines of a sold-out show by the Old Crow Medicine Show at Ballard’sTractor Tavern. I had heard Old Crow about three times on the usually kind-of boring, if pleasant, Prairie Home Companion, and several songs the band had performed had stuck in my head and the band’s aggressive playing had caught my attention as well. They have the good fortune at the moment to be fairly regular guests on PHC (at the show, they plugged an upcoming June 3 appearance), and I had noted with interest that the band appeared to be getting noticeably better with each appearance. I mentioned the band to Greg casually this weekend and he had the foresight to note that the band had two dates slated at the Tractor this week. Some phone tag led to my purchasing three tickets early Monday morning for the Tuesday night show. Sadly, the third ticket, intended for our playing partner Karel, did not get used, as his car broke down in Tacoma as the show began. A cute girl actually asked for the ticket as we entered the bar but I held on to it hoping that Karel would make it. My apologies, cute girl. Ask me next time. The band played two solid sets and two encores with a fifteen minute break – the show ended just before 1, if my fuzzy memory serves. Greg and I really enjoyed the show, for the most part (the well-meaning but hammerhanded banjo-guitar being a distraction, I’m sorry to say). But what was really amazing to us was, first, the overall young age of the crowd, and second, the intensity of appreciation displayed by the people in the audience, not at all undeserved. The extended encores were amazing. The crowd was in absolute, full-throated rapture, with the intensity and energy of any great rock show I have ever been to, and the band, using only acoustic and traditional instrumentation absolutely met and fed that energy. It was an amazing experience, easily one of the ten best shows – one of the five best rock shows, if the music had been rock, which it was not – I have ever been to. Never in my life did I think I would see a room freaking out over the power of the fiddle and the banjo and close-sung harmonies. I have certainly been wrong before, and I hope I continue being as wrong as this all my life, and I hope to be wrong again the next time this band comes into town.